This final birthday card is for a sweet 1 year old girl named Angela who is the daughter of some friends of ours. I decided to use the Lettering Delights Let's Play SVG set. 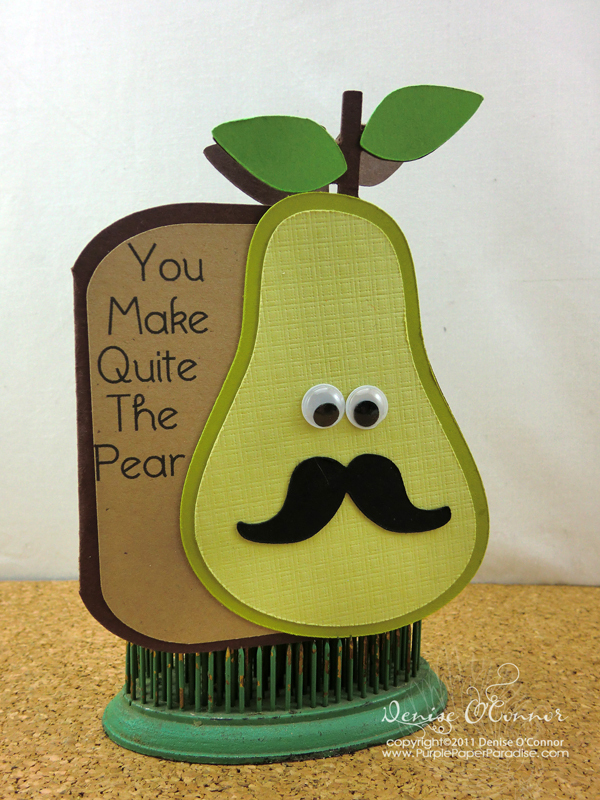 For this card, I printed the sentiment onto my Kraft cardstock and then cut out just the "85" and layered it on top. I used Raspberry Fizz, Aqua Mist, Dark Chocolate, Kraft and White for this card. The doily is from the Doily Details die from Papertrey Ink and the large flower is from the Simple Flower Shapes SVG set from Lettering Delights. and the small flower is from the Flower Fusion PTI die. Of course I had to add a stamp from the Postmarks stamp set too! The large flower is stamped with PTI's Background Basics Tin Type stamp set. Beth from the eCraft_Crafters Yahoo Group figured out how to make SVGs that will have cut lines and draw lines in them. This opens up a world of possibilities for all us expecially with score lines. I can't wait to try this out! She also made me want a Bamboo Craft bad!!! Check out her blog post with her video on how to do this!! Here is another of the 85ers cards and I think my favorite out of the bunch. The color combo here is White, Kraft, Scarlet Jewel, Harvest Gold and Hibiscus Burst. 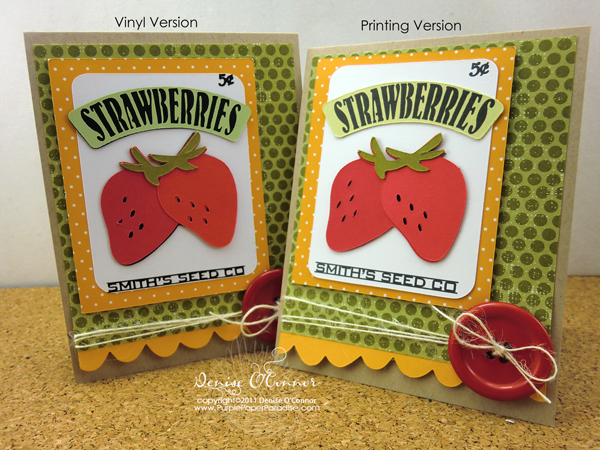 The kraft background is stamped with Papertrey Ink Background Basics Newsprint in Scarlet Jewel ink. I also used the Doily Details, Flower Fusion, and Fillable Frames 1 dies from PTI and just did a lot of layering. The Scarlet Jewel layer is actually a flower cut from my eCraft that was for another project and ended up not getting used. 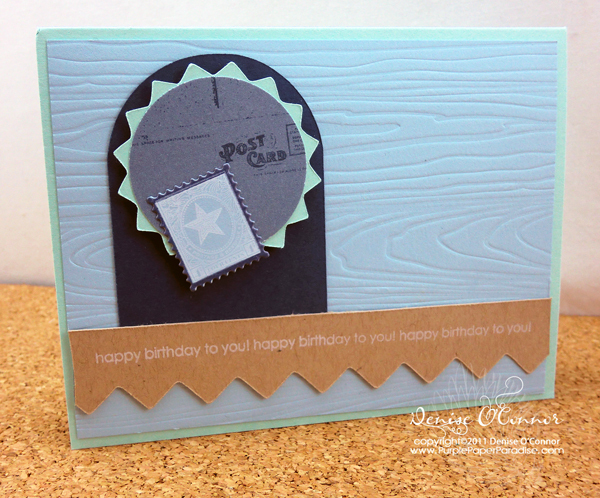 The Hibiscus Burst circle is stamped with PTI Text Style and the FF1 die is stamped with the Birthday Wishes postmark from PTI Postmarks stamp set. I also really like the double layer of white ribbon here. Today's birthday card (and bag) was for my niece who turned two earlier this month. She is such a sweetheart and being that she is the ONLY girl in our family, I just had to do something over the top girlie for her. 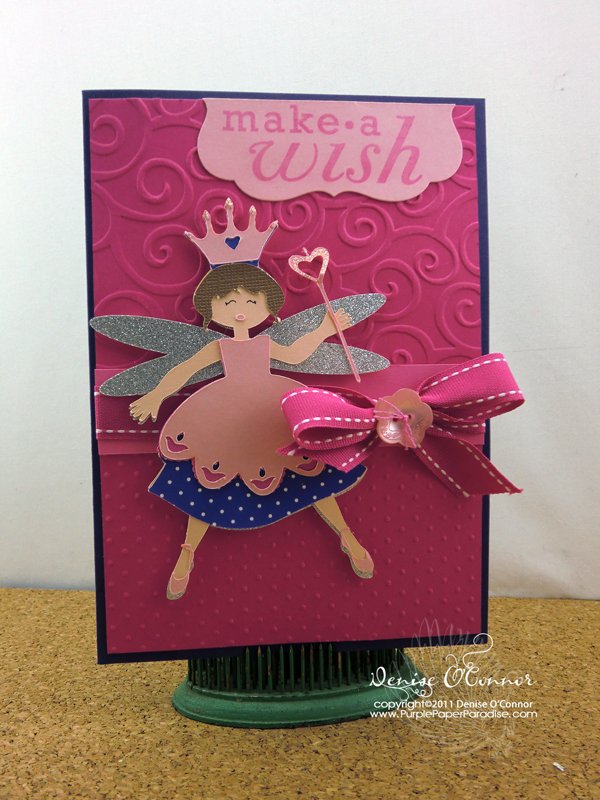 I used the Lettering Delights Provinicial Princess SVG set for the cut files. I used Papertrey Ink Raspberry Fizz and Royal Velvet (love this purple! ), Sweet Blush, Hibiscus Burst and of course some American Crafts Silver Glitter (swoon). For the bag I used another cut from the Provincial Princess set and the same colors. 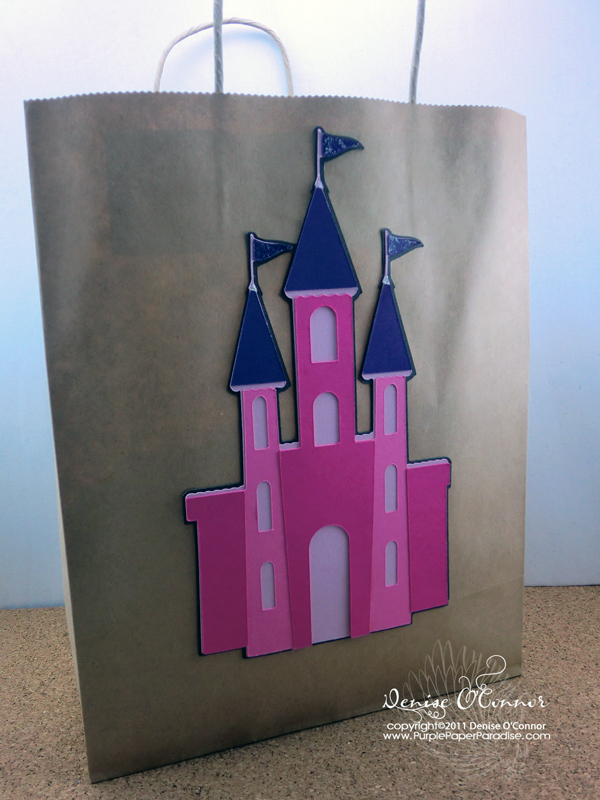 These kraft bags are really inexpensive and it is amazing the impact that they have with a coordinating die cut on them. It was also the perfect size for the summer outfits that I bought for her. 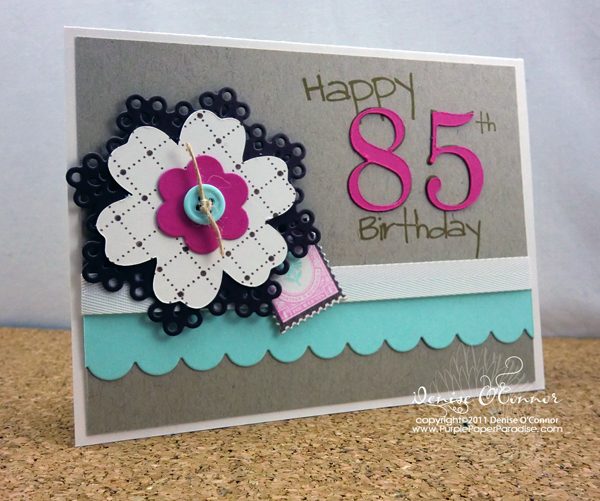 Today's birthday card is for another of the "85ers" and this one is for a lovely lady, but I actually think that this interesting color combo would work great for a man as well (even if it does have a little pink). The layout for this card is the same as the one for the previous card (actually all of the 85ers cards use the same general layout), and I used a new to me color combo of Scarlet Jewel, Terracotta Tile, Dark Chocolate, Vintage Cream, and Raspberry Fizz from Papertrey Ink. 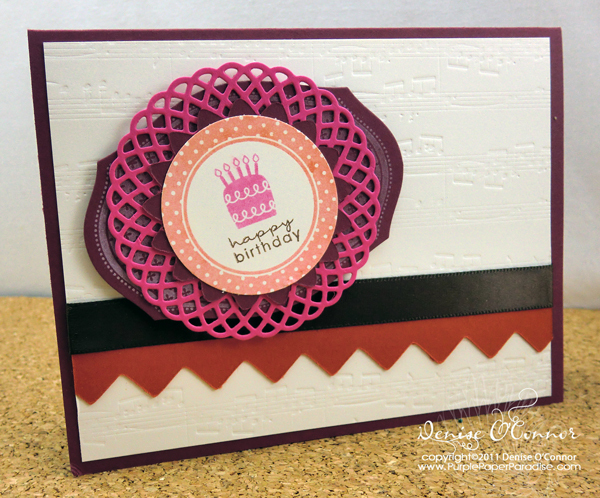 The background was impressed with the Sweet Symphony impression plate and then I used Mat Stack 1 and Tag-its 2 stamp sets from Papertrey Ink along with the Mat Stack 1, Doily Details, and Limitless Layers dies from Papertrey Ink. The border was from an SVG set (don't know where it came from) and cut out using my eCraft. I hope you all are ready to see some birthday cards! We have a bunch of birthdays we are celebrating in April. For starters, on my husband's mom's side of the family there are four (yes FOUR) people celebrating their 85th birthday this year. The family decided to have one party to celebrate all of them! This card is for the only man in the group. I used PTI Aqua Mist, Spring Rain, Enchnted Evening and Kraft for this card. The patterned paper is from PTI Postmarks patterned paper set. The long half circle piece sticking out of the border is a shape that I created in Make the Cut using the basic shapes and cut out on my eCraft. I also used the Woodgrain Impression Plate, Postmarks stamp set and All & Around Sentiments all from Papertrey Ink. I will be sharing more birthday cards here in next few days so stay tuned! 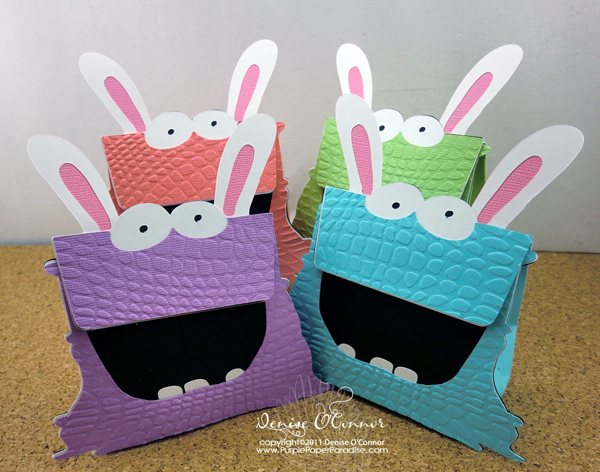 I was thrilled to see the Easter Beastie Bag SVG set from Lettering Delights. I just love the Animal Boxes and Bags set, so this was right up my alley. We always go out to eat on Easter and I try to make a little something for the kids to have at the restaurant because with a party our size (somewhere around 15) the meal always takes a LONG time. The more we have with us to entertain the kids with the better! These are for my two boys and also my niece and nephew. All of these were cut out with my eCraft using the new SCAL 3. I will be doing a complete review of SCAL 3 here soon, so stay tuned for that. Since I am more of an MTC girl, I feel like I have to take a little extra time with SCAL 3 to get more comfortable with it and I want to be as impartial as possible. Once the stable version of the eCraft plug in for MTC is available, I will do a complete review of that as well and then will also do a comparison review of the two programs all for the eCraft owner. Well yesterday, we woke up to a light dusting of snow on the ground. It's April, we aren't supposed to have snow! A few weeks ago, we were enjoying the warmth and sun on the Gulf Coast and now we are back home in snow! But enough ranting about the weather...this card is one that I made as a thank you to my parents for inviting us to their condo on the Gulf Coast. 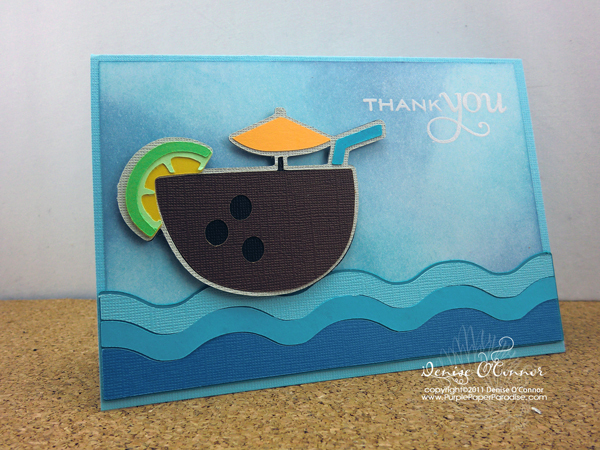 The waves and the tropical drink are from the Lettering Delights Pucker Up SVG set and cut out on my eCraft. The background was created with some Distress Inks and my ink blending tool. The stamp is from the new line of larger sentiments from Papertrey Ink called Think Big Favorites. Now to just daydream about warm weather again. Now for another method! I personally think that this method works great and I generally like the look of it better than vinyl, especially with text and that is to print it. In this tutorial, I will show you a quick and easy way to print small elements directly onto your die cuts. Here is a side by side picture of the two cards that I made. The one on the left is with the vinyl from yesterday's tutorial and the one on the right is the printing method that I demonstrate in today's video. Enjoy! One of the trickiest things that paper crafters come across is cutting out small elements. Even when you can get a good cut, once adhered in place, it doesn't always look so good. Today's tutorial is all about one method to overcome this problem. Instead of cutting these small elements out of cardstock or paper, you can get a much cleaner cut and overall a cleaner look when you cut it out of vinyl. In tomorrow's tutorial, I will show you another way to work with these small elements that I personally like even better then the vinyl method I demonstrated today. Here is the card that I made using the vinyl method. Have a great day everyone! Sorry my post is late today! Today's tutorial is all about using your SVG files as transparent PNG files. This is a really neat thing to do and can be lots of fun. I like to use this technique to create my own patterned papers and it also gives some more versatility to what you can do with these files. To do this you will need to download and install Inkscape. This is a free program and is really one that you should have in your arsenal because there is so much that you can do with it. There are a lot of great tutorials on You Tube for it and if you ever need to edit an SVG, this is the program to do it. Here is a side by side comparison of the two cards featured in the video. 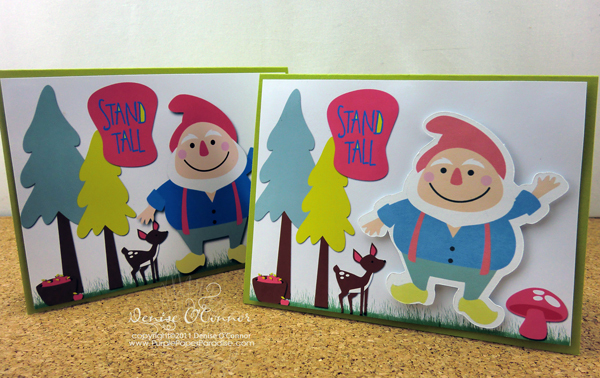 This picture really shows how muted the colors can be when printed on cardstock (the popped up gnome is cardstock), so make sure to get some Matte Photo Paper to use this with, the colors just pop off the page. If you are a digital paper junkie like me, you are going to love this! If you haven't ventured into digital paper, this may inspire you to. What is so great about this is that you don't have to print an entire sheet of the paper. 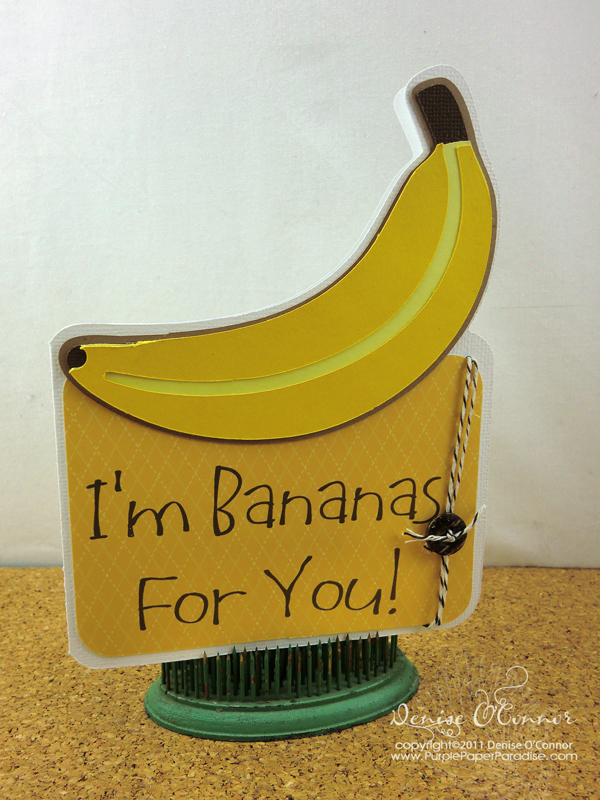 I did this tutorial for cutting to the eCraft, but this can really be done on with any die cutting machine. If you have the eCraft and have not figured out your offset margins for print and cut, then you should do that first. THIS post gives instructions on doing this. I will also be doing a tutorial on this (hopefully will have it up next week). Enjoy! 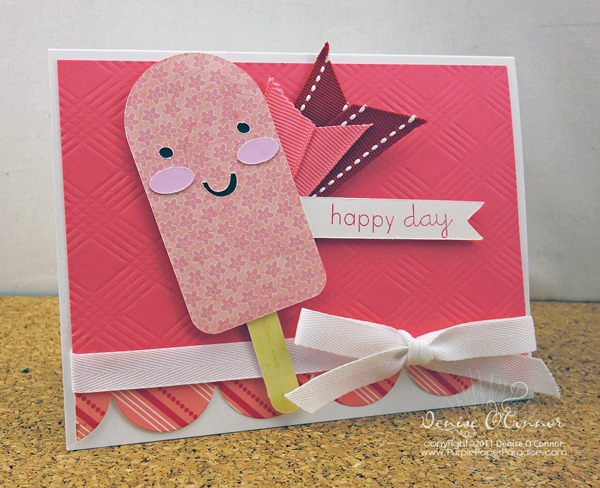 In this tutorial, I took a cling rubber stamp from Studio G and created a shadowed die cut from it. This is a really easy technique using Make the Cut. You will need a flat bed scanner to do this and of course a die cutting machine that works with Make the Cut. I used my eCraft. 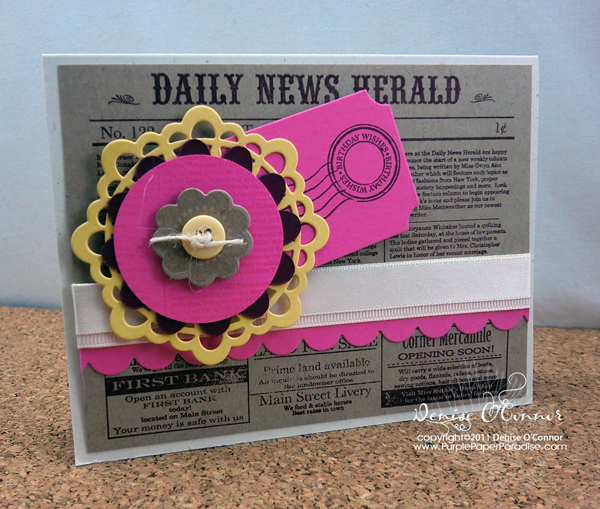 To color in the stamp, I used watered down Distress Inks with some Perfect Pearls. I wish the picture did this justice because it has a great pearlized finish to it! Today is my 35th Birthday! Normally, we don't make a big deal about grown-up birthdays in my family. We usually just get everyone together for a nice dinner out. Last night we went to our favorite pizza place for the most amazing Deep Dish pizza. I have lived in the Chicago area all my life and I have tried a lot of pizzas, but I have to say that this little suburban place is the best!! If you live in the Western Suburbs of Chicago you have got to try Barone's in Glen Ellyn. They have been in business for a long time and their pizza is just wonderful! So for my birthday, I decided to re-design my blog and I hope that you like it. If you have any suggestions for it, please let me know because I love the feedback! I have also decided to celebrate my birthday by doing a week's worth of tutorials for you. I will be featuring the eCraft, Make the Cut, and also some of my favorite SVGs from Lettering Delights. With all the recent "unrest" with Provo Craft (makers of the Cricut line of die cutting machines), I have been getting a lot of inquires from people looking at the eCraft as an option for their future die cutting needs. In light of that, I thought I would share a video today that showcases the eCraft and offers some tips to any eCraft owner on how to get the best possible cuts from your machine. I have to give a big shout out to the members of the eCraft_Crafters Yahoo Group. Most of the tips that I share in the video are not mine! They came from the group and I just wish that I could remember who exactly offered these suggestions because I would love to personally give them the credit and to thank them for sharing! I have been asked by some people to compare the eCraft to the other die cutting machines out there, and I am afraid that I really can't do that. There are two reasons for this, the first is that the only other die cutting machine that I own is the Cricut. The other reason is that it would be extremely difficult to compare the eCraft to any of the other machines because the eCraft is not built like any of the other machines. Since the eCraft is designed to be mat-less, it really changes everything. This is also the very reason why so many eCraft owners have had to go through a large learning curve. I do plan on doing a full review of the eCraft once the stable versions of the SCAL and MTC plug-ins are available. Since the software is such an integral part of the eCraft, I want to make sure that I have played with all of the options before making a recommendation. Right now, both MTC and SCAL are still in beta and there are things that need to be resolved in both programs (although minor compared to the eCraftshop Pro software), so therefore I really cannot definitively say which program is better for the eCraft. You will see in the tutorials coming up this week that I am using Make the Cut. The reason for this is that I am more familiar with the program, but I am keeping an open mind about SCAL for the eCraft. So with that being said, I hope that you enjoy the tutorials that I have planned for this week. I am making a few changes here tonight, so if things look a little funny that's why. I should have everything resolved shortly. 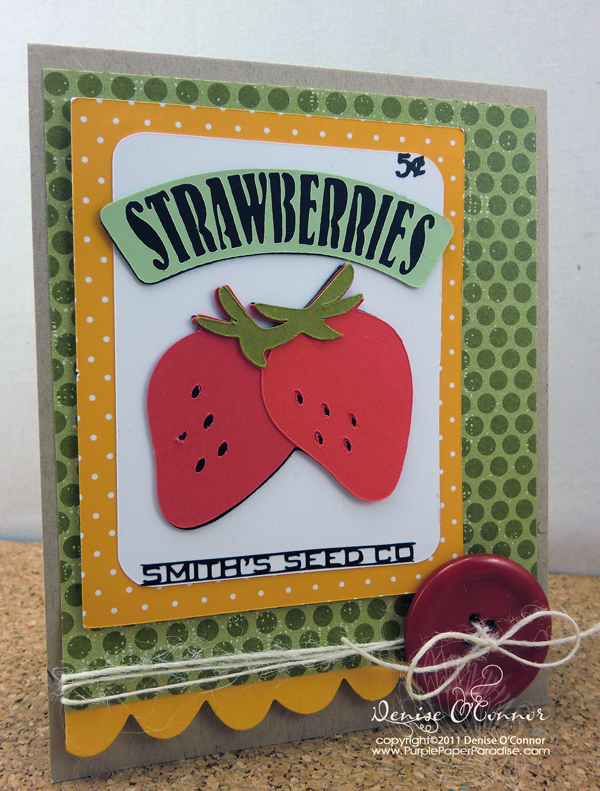 I also took the opportunity to play with PTI's Button Boutique stamp set from their February release. The patterned paper card front is Distressed Dots in Summer Sunrise and I used their Coaster Board to die cut the buttons with their dies and then layered another layer of the Distressed Dots on top. The Mat Stack 4 die is stamped with Distressed Stripes.